There were several prosperous limestone quarries along this stretch of the Hoosic River between Pittsfield and Cheshire MA back in the day. 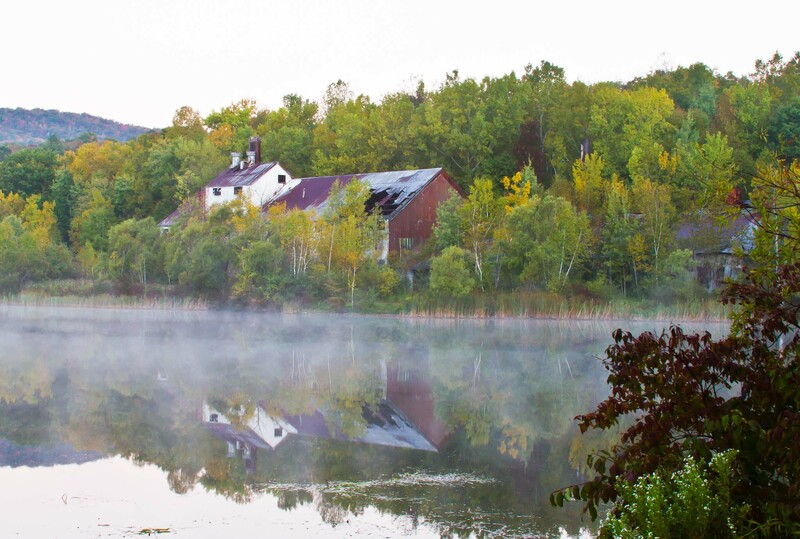 The limestone mining village of Farnams is located in the foothills of Mount Greylock on the west side of Hoosac Lake, or Cheshire Reservoir. The landscape is known as an upland karst valley and contains a system of caves and limestone deposits. The village consists of twenty primary buildings laid out around the crossroads of Lanesborough, Quarry and Farnams Roads. It is an area which contains in a mountainous woodland setting a limestone quarry, originally connected to a limestone processing mill by a railway and tunnel; limestone crusher; workers' housing; office building, stockroom, carpentry shop and a small network of mining roads. Buildings and mining structures in the area date largely between 1900 and 1930. The first quarrying to be done on this property was in the 1840s when Steven Northrup, who was principally a farmer, had a pot type kiln and began a "family quarry" for stone to build with and lime for agricultural purposes. Steven Northrup sold the quarry and kiln in 1866 to the Farnam Brothers Alfred and Albert who were identical twins from the town who had joined the Civil War together and fought in the battle of Gettysburg. The Farnams did a good business according to a ledger account remaining from 1882-1889 averaging about $20,000/year in lime sales. The Farnams continued to add land to their holdings up to 1,400 acres, as well as constructing a building to hold the kilns which had grown in number to three. The Farnams produced "Farnams Blue Label Finishing Lime" and supplied the building trades in New York City with an extremely high quality, pure white lime for plaster. When the company went too far into debt, it was sold to Cornelius J. Curtin in 1905. Cornelius worked in New York selling the lime, while his brother Tom lived in Farnams and managed production. The business was called "The Farnam-Cheshire Lime Company", while Italians had worked under the Farnam Brothers, it was under the Curtins that laborers came mostly from a small village called Postalesio, Italy. Workers hung from the quarry edge on ropes, drilled, and blasted the limestone with dynamite, then cut it by hand to fit into carts. Draft horses pulling the carts then followed the roads around the south side of the mountain down to the mill where the stone was processed before being sent off in barrels on the railroad whose tracks ran between the mill and the Lake. At first the Curtins built a tramway to transport the rock to the mill, but when even that was insufficient, they drilled a tunnel a half a mile long through the mountain and installed a narrow gauge railroad. The tunnel was completed in 1915/16. Hopper cars pulled by a steam engine transported the stone to the mill and the business prospered. The Curtins fired 21 upright kilns with wood. Subsequent owners used coal, coke and finally gas. A limestone crusher between the quarry and mill was erected in 1930; stone went by conveyor from crusher to sorting house, then by railroad to the mill. Air hammers used by 1941 to drill the stone, then insert dynamite. In 1950s they were mining from the surface so discontinued use of the train and tunnel and used gigantic dump trucks to transport stone to the crusher. The mill itself was added to over a period of years between 1906 and 1929. With no heirs to run the business it was put on the market and sold in 1929. Curtins were said to have built housing for about twenty families. In addition to the workers' housing, the company owned a farm which was leased to the Rozon family who provided dairy products to the village. Their tenancy continued through company ownership by US Gypsum. Extracted from: Farnams Village Historic District application to the National Register of Historic Places.